We are honoured and excited to be bringing you what can only be described as a hotly anticipated novel : Dedalus, by Chris McCabe. Friday 17th June 1904. Stephen Dedalus wakes up in a Dublin Martello tower, hungover but with winnings in the pocket of his borrowed trousers. 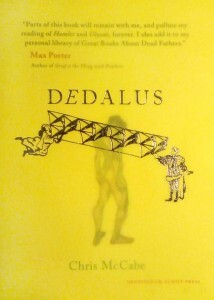 Dedalus goes about his day. Settling scores and debts. Pursued by the ghosts of his mother, Hamlet, and now a man called Leopold Bloom who has woken up with plans for him. The young poet weaves hopes and ideas into burning wings of ambition. Can he elude death in the passages of books? McCabe’s iconoclastic tribute to James Joyce’s masterpiece gives right-of-reply to his self-portrait, Stephen Dedalus. Stephen and Bloom, cut from Joyce’s ego, become cultural types pasted into Digital Age storytelling. Join us for a can of Forty Foot beer 😉 music, and an interactive reading : you choose which path we take as we dip into the book. You can turn up on the day, but email us (RSVP here) to be added to the guest list and receive updates. We are delighted to be hosted by Queen Mary University of London Department of English : The London home of Joyce scholarship and Ping’s alma mater, where she studied Ulysses and first introduced it to David. Without this introduction editing this book would have been impossible. QMUL offer cutting edge courses in Modernist Literature and Creative Writing. This is the place to be. Chris McCabe is the author of four poetry collections, most recently Speculatrix (Penned in the Margins). Pharmapoetica, with Maria Vlotides, was shortlisted for The Ted Hughes Award and his plays Shad Thames, Broken Wharf and Mudflats have been performed in Liverpool and London. His non-fiction series, searching for a great lost poet in one of London’s Magnificent Seven cemeteries, begins with In the Catacombs: a Summer Among the Dead Poets of West Norwood Cemetery (selected as an LRB Bookshop book of the year) and Cenotaph South: Mapping the Lost Poets of Nunhead Cemetery. He co-edited, with Victoria Bean, The New Concrete: Visual Poetry in the 21st Century (Hayward Publishing, 2015). Owning the means of production is one of those luxuries which can change your trajectory in life so much, it is a gamechanger. This especially applies if you’re an artist or writer at those fragile early stages where you are full of skills and promise and energy, but have nothing much to your name (yet). The Hogarth Press was exactly this kind of instrumental luxury in Virginia Woolf’s life. The effect its existence had on her creative and political output is still, I feel, rather underrated in current Woolf scholarship. The absolute freedom of speech the Hogarth Press allowed Woolf had an enormous impact on her ability to think and experiment. Not only was the mental space it provided essential, but, since there are so many handbound Hogarth Press books by Woolf in existence, as artefacts they also have an important story to tell. And of course, in addition to to Woolf’s own writings, there was the tremendous intellectual legacy of the Hogarth Press publications, for example, the first English translation of Sigmund Freud’s Complete Works, or the first UK edition of T.S. Eliot’s The Wasteland, lynchpin of the Modernist Canon. Could the Woolfs have known that by putting down their £19 5s 6d on 23rd March 1917, and becoming proud owners of a small hand press, they would so profoundly sculpt the terrain of literary and intellectual modernism for years to come? 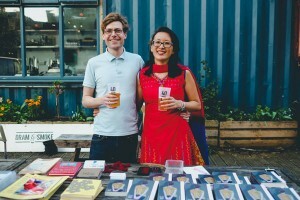 The Hogarth Press’ informal beginnings as a hobby-turned-business makes this seem unlikely. In fact, in many ways, the cheerfully enterprising spirit with which they plonked their money down for the first press was central to its future success. It is well known that the Woolfs first decided to print books by hand partly because they needed to find a therapeutic activity to absorb Virginia outside of her writing. The fact that the couple’s first flawed but charming hand-pressed publication, Two Stories (1918) quickly broke even, and then was followed by the unexpected success of Kew Gardens (1919) encouraged them to carry on in an ad hoc way. The expansion of their original vision meant they tackled more ambitious projects which gradually led to many Hogarth Press books being outsourced to commercial printers and binders. However, despite the increased production and greater distribution that outsourced production made possible, as well as the fact that the professionally made books were generally better printed, bound, and designed, the Woolfs continued to hand make books for sixteen years; producing at least one handset (if not also hand bound) book a year alongside many more outsourced titles. There is no easy explanation as to why the hand made books abruptly stop in 1932. It is likely that it was not merely because, despite being as Leonard Woolf writes, ‘a mongrel in the business world’ (p.242) the Hogarth Press now had enough stability and notoriety to survive without the attention-grabbing and money-saving device of hand made editions, but also perhaps because that year marked a significant turning point in the Woolfs’ lives. 1932 was a difficult year for the Woolfs in many ways. Firstly their good friend Lytton Strachey died a slow courageous death from stomach cancer and, as Hermione Lee observed, it was a death that for Virginia ‘left the greatest silence.. a closing down of the past; it made her feel (as she always in anycase tended to feel) older, more mortal, part of an age that was past.’ (p.630) It also affected Leonard acutely as he felt that, coinciding with the rise of Nazism and the Second World War, ‘Lytton’s death marked a point of no return.’ (Lee, p. 630) Their grief was augmented in March when Dora Carrington, Strachey’s companion, shot herself in response to his death. Next, John Lehmann, the last of many bright young things whom the Woolfs had engaged as a manager/potential partner of the Press, walked out and they were left to struggle without a proper manager for several years. Lastly, in October of that year, Virginia’s many preoccupations suddenly came together into one new project. Thus she embarked wholeheartedly on what was to become The Years, a book which so consumed her energies it had an ill effect on her mental health. Perhaps this stressful series of events sapped some of the original energy and enthusiasm needed for a literal ‘hands-on’ approach. When John Lehmann returned in 1938, Virginia sold her half of the Press to him. Since Virginia was the stronger typesetter and binder out of the Woolfs, perhaps her lesser involvement also contributed to the discontinuation of handmade titles. Whatever the reasons for in-house handmade production ceasing at the Hogarth Press, by this point the cultural space they had hoped the Press would provide had clearly become a stable reality. However, the same dynamic and independent spirit behind the handmade books was still very much at the heart of the Hogarth Press. What this paper deals with is the rubric of the handmade books themselves, since as objects they are neither fine enough to be included in the fine printing tradition nor conventional or numerous enough to fit in the publishing world proper. This inbetweeness characterises the cultural niche that the Hogarth Press opened up and occupied as was conceived and grown under the Woolfs’ direction. By understanding where the handmade books stood or stumbled in terms of being art objects, part of the book trade and as ideological statements, we will see how they are physical manifestations of the process by which the Woolfs freed themselves to write as they pleased. The handmade books, as objects made not by accomplished book artists but rather by prolific writers, were a curiously unusual form of luxury. Yet it was exactly this unconventional approach that made possible the necessary luxuries of the Hogarth Press. This contrasts sharply with the deliciously opulent dinner Woolf describes a few pages earlier, given at a men’s college. It is significant that the glorious flight of her prose produced by that dinner, in which rapturous thoughts spiral closer and closer to more weighty considerations of the consequences of war, are cut off by a ‘plain gravy soup’. Likewise, the failed visit to the college library also shows how intellectual restrictions are embodied by physical disadvantage. The parable of Shakespeare’s sister demonstrates this, as an attempt to follow in her brother’s footsteps leads instead to scorn, indifference, the imposition of chastity and the denial of material wealth. Her rapid descent, ending in suicide and obscurity, paints a tragic picture of ‘a woman at strife against herself.’ Thus Woolf concludes, a woman ‘born with a gift of poetry in the sixteenth century, was an unhappy woman’. This was because, ‘[a]ll the conditions of her life, all her own instincts, were hostile to the state of mind which is needed to set free whatever is in the brain.’ (p. 46) By this it is clear that Woolf thinks nurturing the whole of life – that is, material comfort, spiritual freedom and as well as familial and societal support – is absolutely necessary for true creative endeavour. Financial poverty being equated to social barrenness in Mrs Dalloway is again highlighted by Ellie Henderson when ‘her panic fear, which arose from three hundred pounds income and her weaponless state (she could not earn a penny) [..] made her timid’ (p. 171). By showing these women suffering in situations where they should be enjoying themselves, Woolf puts forward the paradox that one must have enough of a financial reserve so that the act of consumption itself do not consume the consumer. Thus, Woolf’s alternative economic morality also denotes that material goods have their uses, but in order to enjoy them properly (i.e. as they are meant to be enjoyed) accumulation of them must reach a certain standard, that is, beyond what is absolutely necessary to possess them. In short, to live a full life, one must have both social and financial status which is beyond simple necessity – the very definition of luxury. Furthermore, although necessity dictates that life must start from materiality, ideally this will be a means to a nobler end, and not the end itself. For Virginia Woolf, the luxury of independent intellectual freedom was created by the Hogarth Press. Its insulating effect gave her the courage to write experimentally. For example, it was not until the Woolfs had purchased their first hand press, issued notices of their first publication (Two Stories) and already started printing Leonard’s contribution, that Virginia started to write in a way that really broke away from conventional realism. Although she had already published two novels to some success through Gerald Duckworth’s publishing house, Duckworth & Co. were not really avant-garde publishers, and Virginia still harboured some ill-feeling against her half-brother. (She would later accuse him and his brother George of sexually abusing her as a child.) When we factor in, as Leonard Woolf observed in his autobiography, Virginia’s ‘hypersensitiveness to criticism’ (II, p. 223) – which paralysed her with horror at the completion of each novel until she had received a favourable reception from trusted critics – it is not difficult to see how the prospect of having to submit another work to her half-brother would not have been conducive to bold experimentation on her part.. Just as her Bloomsbury circle afforded freedom from the conventions of chastity, the dynamics of self-publishing as the Woolfs conceived them meant that the ‘inestimable price of editorial freedom’ was theirs. As J. H. Willis Jr. noted, though a fearful and anxious writer, the Hogarth Press was instrumental in freeing Woolf to become ‘what she wished as a writer without the real or imagined criticism of a publishers’ reader’, plus it also meant that ‘[she] need never feel an unsympathetic or repressive male editor looking over her shoulder’ (p. 400). Woolf herself wrote in her diary that she was, ‘the only woman in England free to write what I like.’ (Willis p.401) Furthermore, from 1929 to 1939 the Press contributed at least £1000 year to their existing income and since their expenditure had remained much the same in this period, they were able to use the money to make major lifestyle changes. Thus they were able to afford the luxury of being able to discard the model of Victorian domesticity by replacing the cook and other live-in servants with ‘things which make it easy “to do for yourself”’ and staff in off-site accommodation. Profits from the Press also contributed directly the purchase of their first car – a second-hand Singer in 1927, which added welcome speed to their pace of life (Leonard Woolf, Journey, p.99). It is interesting to note how the intellectual autonomy of the Woolfs’ was paralleled by an increased sense of freedom within their lifestyle in general. It seems that the space that these necessary extras provide is essentially a springboard to better things beyond the present; a means to a nobler end, and not the end itself. But an actual Hogarth handmade is not luxurious. At least, not in the material sense. An examination of the British Library copy of The Waste Land reveals inadequate inking (i.e. too light to be comfortably legible in places), a badly cut cover label and the absolute minimum of stitching unevenly spaced – features evident in nearly all the handmade Hogarth books I examined. The Senate House copy has similar problems, plus ink blots throughout, with botched gluing sticking the title page to the leaf before it. Furthermore, page twenty-five is cut short at a diagonal and they appear to have run out of the marbled cover paper, which comes just short of the endpaper. As James Beechy observed, they are noticeably absent from most private press histories, perhaps due to the marked difference in production values, ‘Unlike many private presses founded in the slipstream of the pervasive Arts and Craft movement, The Hogarth Press was not concerned with editions de luxe’ (p. 15). This summary of Hogarth Press production is a polite understatement. The books themselves are almost precocious in their material inadequacy. If there is anything deluxe to be found in the press publications at all, it is that they were made by highly skilled writers, and it is this auratic intellectual association which give them their market value, not the quality or durability of the material product. It seems that for the Hogarth books to be classed as deluxe, a different definition of luxury must be found. In The Price of Modernism: Publishing The Waste Land, Lawrence Rainey gives very interesting and detail-oriented revision of The Waste Land’s process of canonization, and in order to do so he depends upon an established avant-garde ‘tripartite publishing program’ of elite, deluxe and mass dissemination (pp. 77-106). This method of tiered publishing is so established today, we hardly notice it – for example everyone expects a paperback to follow a hardback, with a fine-bound limited edition sometimes commissioned for the discerning elite. Even indie record labels have adopted this form of publishing, with CDs and digital releases being followed by special edition vinyls and the suchlike. Rainey’s assumption that deluxe in book publishing means a limited edition made from valuable materials is well-founded considering the output of other contemporary presses. The examples he gives for the deluxe level of modernist tripartite publishing, such as William Morris’s Kelmscott Press or Yeats’ sisters’ Dun Emer (later Cuala) Press produced exquisite work. An examination of the Dun Emer Press’ Broadsides: A Collection of New Irish and English Songs (1937), a collection of ballads written by Yeats and printed by his sisters1, reveal rich, even inking, with the illustrations coloured by hand and musical notation on every ballad sheet adding to the sense of luxurious printing. Looking at a Kelmscott Press book, A Dream of John Ball (1892), a political treatise written by Morris himself, it is clear from the quality of the design work and execution why they were the benchmark that most later presses aspired to. The printing is, of course, impeccable, which is no mean feat when one considers the intricate woodblock illustrations and illuminated text, and that Morris’ bespoke inks caused much frustration to his printers due to their viscosity. The binding is similarly exquisite; the specially commissioned white vellum cover creating an almost translucent effect. Morris was second only to the Vatican in his demand for unleaded, flawless vellum. Needless to say, the materials used in both these projects are of the highest quality and both these specimens, kept in the same collection as most of the Hogarth Press books I examined2, do not appear to have aged at all. This is generally the norm among fine hand-crafted books. 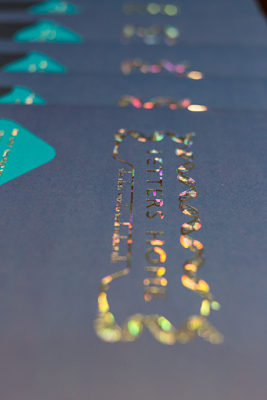 High quality paper and glues coupled with skilful application of tried and tested binding techniques usually ensures this. Thus these books are a marked contrast to the Hogarth handmade books whose naïve enthusiasm and unselfconscious experimentation in binding (often with disastrous results) share more with the energetic scribbles (and frequent ink blots) of the Stephen children’s Hyde Park Gate News than with the accomplished history of fine print and bookmakers. Perhaps it was the Woolfs’ eagerness to utilise the work of friends that led to them printing things which should have been beyond their ability. Examples that spring to mind are not only The Waste Land, but also Hope Mirrlees’ Paris, both of which employ several languages, both roman and italic type, and enough specialised spacing to give even an expert typesetter trouble. The resultant texts (including these last two examples) often had to be hand corrected by Virginia after printing. Another good example is the first edition of 12 Original Woodcuts (1921) by Roger Fry which again is only secured with the minimum of stitching – only three holes. This is especially inadequate for this particular book because of the thickness of the paper used. Much thicker than usual Hogarth Press stock (perhaps in honour of it being ‘fine print’ book), they end up forming a ‘V’ shape at the spine because there are too many sheets to comfortably fit in just one fold and choir. This ‘V’ shape is also echoed by the page ends, which have not been trimmed after binding – a characteristic which is again apparent in most Hogarth handmades. With fewer sheets, five holes and a trimmed edge this would have been an acceptable method, but the best and most orthodox way to bind pages like these would have been to stitch them in smaller numbers, then sewn the subsequent three or four choirs together. This appears to have been too labour intensive for the Woolfs, who, as far as I know, never employed this practice. The result is a ‘fine art book’ which neither opens nor shuts properly. The inner pages are also folded against the grain direction of the paper, which decreases the lifespan of the book; as every professional bookbinder knows, the grain should run parallel to the spine. These technical errors are exacerbated by an amateurish appearance; the ‘marbled’ paper that Fry himself made by throwing paint in random splashes at ‘recycled’ wall paper was far too heavy and poor in quality for this purpose. As Donna Rhein points out, the traditional method of marbling is to suspend colour on water in order to float the design onto the paper. (p. 27). Fry’s unorthodox approach means that the cover, now brittle, is prone to cracking and breaking off in parts. One might give Fry and the Woolfs the benefit of the doubt, perhaps as amateur binders they simply did not possess the depth of experience to have foreseen what problems using inappropriate materials might create, but mere inexperience does not explain the lack of care in execution – for example the front label is not even cut squarely. These recurring technical imperfections, as well as many others too numerous to list here, are all regular features throughout Hogarth handmades and mean that they are quite justifiably left out of fine press histories. The fact that Rainey neglects to physically describe a Hogarth Press edition of The Waste Land, is perhaps because of the frustrating incongruity between its aspirations and humble appearance. Simply put, the handmade Hogarth Press books, the category which is usually deemed ‘deluxe’, were so badly made that, even their mass produced counterparts tend to wear better than they. In the Lilly Library (Indiana University) copy that Rhein describes in The Handprinted Books of Leonard and Virginia Woolf at the Hogarth Press there is even an advertisement for past titles from the Hogarth Press printed in the back of the book (Rhein pp.23-24). Far from treating the production of this book as a limited deluxe English edition, the Woolfs appeared to have decided they would make the most of the publicity from what they thought would be a good seller. Rainey’s suggestion that Eliot’s commission of The Waste Land was an afterthought of Eliot’s to complete the tripartite system also seems less convincing if one considers that it was not necessarily limited, since the Woolfs were not averse to making more copies to cater for demand – even when the original materials had run out. In the case of The Waste Land, the suggestion that the Woolfs ran out of the original marbled paper is supported by the fact the British Library copy is covered in a completely different, textured, black paper.3 In fact, for a handmade book by amateur book-binders, the 460 copies of The Waste Land could be considered a large print run. The lateness of the publication may also be due to the fact it always took the Woolfs a long time to typeset anything, especially because in this case Virginia took extra care to ensure the poem was spaced well, which it was. Indeed, Eliot himself said that he preferred the appearance of this edition to its American counterpart. Having examined both editions, it is evident that the unconventional proportions of the Hogarth Press edition caters much better for the spacing of the lines than the Boni and Liveright edition which is not wide enough and breaks up the vast majority of its long lines. Thus the personal care and high priority with which the text is treated by the Woolfs is clear, despite the dubious quality of its total execution as a ‘deluxe’ book. ‘[T]he public and the private worlds are inseparably connected, the tyrannies and servilities of the one are the tyrannies and servilities of the other [..] we are not passive spectators doomed to unresisting obedience but by our thoughts and actions can ourselves change that fire. A common interest unites us, it is one world, one life. Thus one can see that, as a group of already famous individuals, the material commodities were simply vessels used to distribute awareness of a fragmented yet interconnected world. Their belief in the power of private consciousness to affect mass culture shows how, ideologically, this was the most important result that the luxury of independent intellect could bring forth. As friends of Eliot at the time, and critics whom he trusted, it was the Woolfs’ pleasure to extend to him this same luxury of unadulterated exposure made possible by the Hogarth Press. A niche as culturally significant as the one that the Hogarth Press occupied is not simply spotted but made. The fact these historians do not realise this is perhaps due to a misplaced ‘sense of perspective.’ One might suggest that it is this inflexible kind of ‘sense of perspective’ that drives Septimus Smith out the window in Mrs Dalloway because it does not give enough credence to the possibility of consciousness being ‘a seeing that literally makes and re-makes life moment by moment’ (Wicke p. 120). That an anomaly like a market for badly made ‘deluxe’ books persisted reinforces the idea that the Hogarth Press’s self-published and self-made ethos permeated the consciousness of the people around them. Although the material success of the press was founded upon factors like good artistic choices, sensible accounting, and good timing, above all, it was holding steadfast to the self-knowledge that the only way they could guarantee the longevity of their enterprise on the terms they wanted it (i.e. complete artistic control despite being a part-time occupation) was to limit their operations, and not be self-conscious about the fact they would remain ‘a mongrel in the business world.’ The physical fruits of their labour, exemplified by the handmade books, express this hybridity in every hurried misplaced stitch on the edge of beautifully spaced text, every enthusiastically chosen avant-garde cover-paper which was as personally loved as it was impractical. Other presses which followed in the footsteps of the Hogarth Press and had similar aims, such as Laura Riding’s Seizin Press, or Nancy Cunard’s Hours Press (both authors of Hogarth handmade books) simply lacked the ability to grow and become stable, sustainable cultural challengers, as the Hogarth Press did. At least part of the Hogarth Press’ longevity must also be due to the way they pursued this ‘leisure’ activity of a hobby-turned-business with the same all-consuming intensity with which they tackled the ‘proper’ work which occupied their mornings – that is, writing. The way the Woolfs kept the Press physically close to them, (literally living under the same roof until bombing during Second World War forced them to relocate), intertwining the functions of the Press with their daily lives and resisting opportunities to expand so they could maintain total control over all aspects of the business showed that their personal investment in it was much more than just money or time – although Leonard’s shrewd business sense played as much part in their success as Virginia’s talent. Thus although both the Seizin Press and the Hours Press produced beautiful books of some cultural weight, they folded in less than ten years, in contrast to the Hogarth Press which, even after Virginia’s death in 1941, had been in production for over two decades and was still a strong presence on the publishing scene. 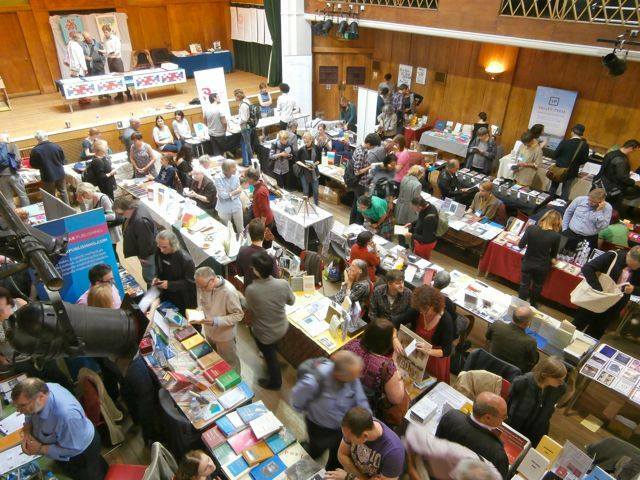 The slow and humble beginnings of the Hogarth Press was an advantage when it came to cultivating a nursery for new talent because the support network was mature and the community real. By preferring to limit editorial meddling to the bare essentials the Woolfs also, to some degree, extended the luxurious freedom of uncensored creativity to others. In this way, the Hogarth Press increased the status of the Woolfs amongst their peers. And unlike other private press owners who mainly published their own work, these acts of generosity – like Clarissa Dalloway’s reversal of the spendthrift economy – stood them in good stead as it also extended their cultural potency far beyond their immediate circle. That just under thirty years ago, Hermione Lee (who has since become the go-to academic on Woolf) classed her only ‘in the second rank of twentieth-century novelists’ (Lee, 1977, p.14) shows how the dynamic force of Woolf’s writing has continued to affect our consciousness. In the many decades following her death, the feminist legacy which Woolf worked on under the shelter of the Hogarth Press continues to grow, albeit not always in a fashion she would have approved of. However, despite having to deflect no small amount of scorn along the way, her stature now as a central figure within the modernist canon shows how well she used the uniquely privileged position she made for herself. Ping Henningham is Co-Director of Henningham Family Press with her husband, David Henningham. She studied BA Art History at UCL and MA Modernist English Literature at Queen Mary University of London. This essay was originally written as part of her MA, and has been published as a blog in celebration of the 100th Anniversary of Leonard and Virginia Woolf starting the Hogarth Press. To see photos of some of the books I examined for this essay, you can now just click onto the British Library blog. 1 Issued as single ‘ballad’ sheets but later collated and bound for collectors. 2 This is the Sterling Collection which is now kept by Senate House Library, University of London. 3 As Rhein notes(p.23), it was quite typical of the Woolfs to underestimate the amount of materials needed and have to buy in more, often completely different papers to complete the run. As with many Hogarth Press handmades, there are also several variations on the front cover label for The Waste Land, some with underlinings, some with asterisks and some with no other embellishments. The exhibition of An Unknown Soldier at the Royal Festival Hall that ran from November to January has now come down, but it will have a legacy in the Poetry Library for a few years yet. We have collaborated on a book of exercises in writing Modernist poetry with Librarians Chris McCabe, Lorraine Mariner and Pascal O’Loughlin. 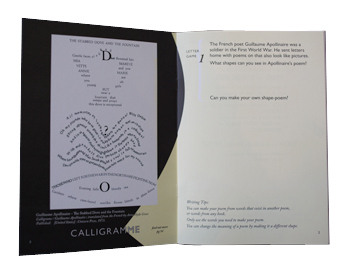 This all ages resource (6+) introduces some of the movements in poetry that the First World War helped introduce to the world, such as Apollinaire’s Calligrammes, Imagism, Vorticism, Surrealism and Dada. It will primarily be used to guide school groups or individuals visiting the Saison Poetry Library off the more familiar paths through war poetry, but hopefully it will have legs far beyond the Royal Festival Hall. 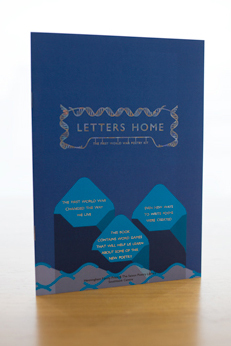 Most of the letter games reference the enormous amount of correspondence between Home and Front; 2 billion letters and 114 million parcels. In keeping with our exhibition, inspired by the recent use of DNA on letters home to identify casualties, the book culminates in a game we devised that takes the rules DNA uses to build our bodies to build a strand of visual poetry that can be split and rewritten by a group. The negotiation and collaboration involved is intended as a contrast to the abuse of language and power that war entails. Just like a human body is built through the writing and reading of base-pairs, solidarity in a body of people is achieve through the honest use of arts and language. 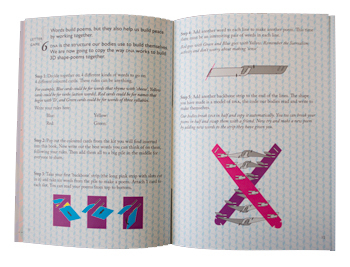 The pieces punch out of a die-cut sheet and are assembled as part of the collaborative writing process. If you are interested in using this resource at the Poetry Library you can just pop in and ask for it, they are free and the Librarians can help. Bigger groups can arrange a visit with Chris McCabe via the form on the Library website. If you are interested in acquiring a batch of these for educational use offsite you can also contact us here directly, or Chris McCabe at the Library.